If you’ve ever read the Mid Wife Crisis blog you’ll know what to expect from this book because it’s based on that blog although it’s much more than a collection of unconnected posts. One of the things the blog did well was present this story as if it were happening in real time. Events were previewed or discussed on twitter and Facebook as well as on the blog and the author Polly James engaged with readers about those events as well as news and current affairs. She still does which has made a lot of people feel very involved in the production of this book. That includes me: after a few half-hearted attempts to work out which MP the author worked for, I settled in to enjoy the story unfold. 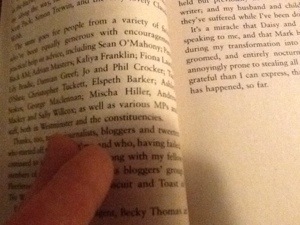 We’ve stayed in touch since then and she kindly included me in the acknowledgements – a first for me which was probably more exciting than I should admit to. The blog format served the story well because the novel itself takes the form of a diary written by Molly Bennett, a wife and mother struggling to deal with the disappointments and demands of modern life and relationships. It casts a very funny yet gimlet eye over all these everyday trials. The simplicity of diary form and light tone are deceptive: you may feel you’ve seen these characters before but Polly James has given them all new twists and the plot packs proper emotional punch. What really makes this novel different though is that it’s laced through with politics and political satire. Molly works for a Labour MP, Andrew Sinclair. Caught up in the business of politics, he’s become vain, bullying, paranoid and forgetful of the principles which took him into the job in the first place. Molly and her colleague Greg take the strain for him in his constituency office, managing disgruntled and occasionally obsessive constituents while he takes long lunches, claims credit for any successes and causes his employees more problems than he solves. So as usual on a Friday morning, I have to sit listening to The Boss promising the impossible to each constituent who has an appointment, before he leans back and basks in the love in the room. Later, it’ll be down ti me to tell them that what he’s promised is up feasible, or against regulations, or whatever – and then the constituents will phone him to complain, about my attitude. Those constituents are the source of most of the book’s comedy and some of the drama. From the stalkerish Mr Beales to Mr Lawson with the hole in his skull who wants trepanning on the NHS, they are mostly grotesques, exaggerated versions of the ‘usual suspects’ who pester politicians. The genuine cases are heartwarming and heartbreaking. 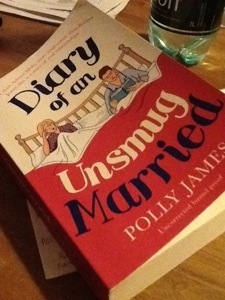 Its title and cover show that ‘Diary of an Unsmug Married’ is being marketed at fans of romantic-realist comedy like Bridget Jones. It has that, both in form and tone. But it’s also a very funny look at politics from an often-overlooked point of view.